Rum by name, Cognac at heart. Don Andres Brugal Montaner launched Brugal in 1888 to break away from the traditional styles of the time and to create a distinctly different Rum. Apparently, there are two things that set Brugal apart from others. First, the method of distillation, which removes much of what other Rums leave in. The Spirit is thus cleaner, dryer and less sweet. Secondly, every drop of Brugal is cask-aged, using the same wood policy as the World’s best single malt Scotch Whiskies. The Brugal family recipe is a closely guarded secret, preserved in the hearts of a privileged few, passed down from generation to generation. The Brugal Rum warehouses are actually positioned in such a way that makes the most of the Dominican sun from morning to night. This unique access to the sun intensifies the aging process. After being distilled, their Rum’s are aged for up to eight years in handpicked American oak casks. 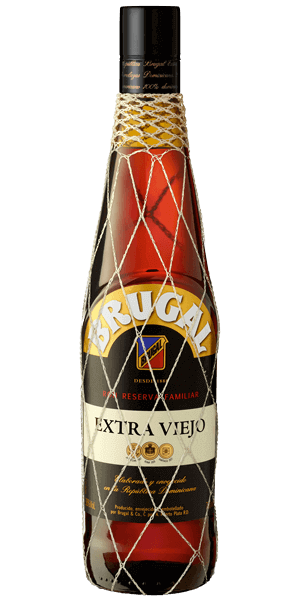 Brugal Rum Extra Viejo is, as Brugal puts it, a “truly stunning rum. Its elegance, aromatic charm and flavor may remind you more of a Cognac than a premium Rum, but a premium Rum it is.” Prepare your tongue for a veritable orchestra of flavors; delightful, natural notes of wood, dried fruits, almonds, cocoa, vanilla, orange peel, caramel, and molasses. The palate is as dignified as ever, with refined flavors that that greet the tongue with hints of vanilla, caramel and touches of honey, followed by sweet spices and rich cocoa. And yes, it is as delicious as it sounds. What does Brugal Rum Extra Viejo taste like? The Flavor Spiral™ shows the most common flavors that you'll taste in Brugal Rum Extra Viejo and gives you a chance to have a taste of it before actually tasting it.